In close cooperation with your organisation, Madenco develops and supervises products for training, e-learning and serious gaming. 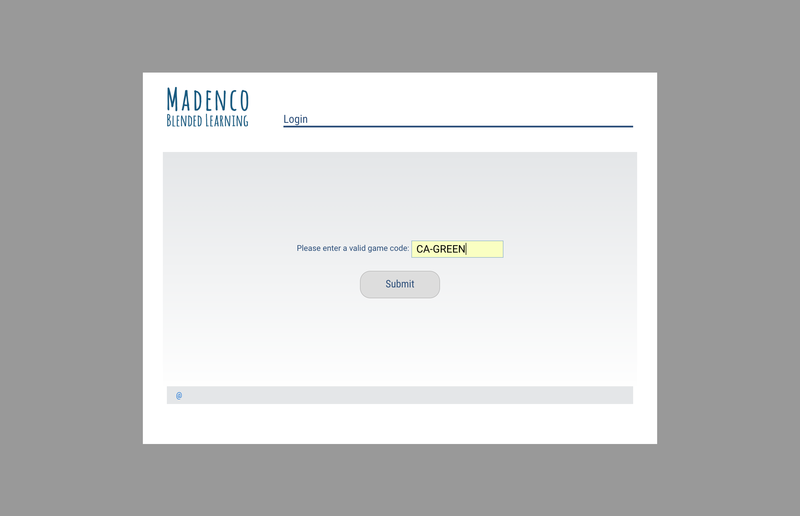 Madenco has developed the Game Engine, a Content Management System (CMS) for the development, management and execution of practice simulations. Such a practice simulation offers participants the opportunity to ‘do an internship in the future’. In a number of rounds, teams experience ‘playing against each other’, which means working together within the context of a simulated practice. This concerns knowledge and skills, as well as attitude and behaviour. Creating acceptance can also be one of the objectives. An old Chinese proverb says: ‘I hear and forget. I see and I remember. I do and I understand.’ Simulations offer an active and direct way of experiential learning and are able to accommodate more complexity and realism than the classic role plays or case studies. Participants are intensively involved. They forget that they are part of a simulation and not of reality. Participants receive personal feedback during the simulation. They are confronted with the results of their actions. Often years later, participants remember very specific moments from a practical simulation. Manage the name of the game and the number of rounds. Per round setup of the time, used media, cases, e-mails, documentation and instructions for game supervisors. Management of videos, images, logos and context maps to be used in the rounds and cases. Team assignments focused on cooperation and consultation. The number of subtasks per case is variable, as is the form (instruction, open-ended question, multiple-choice 1 option with/without explanation, multiple-choice option with/without explanation). Team assignments focused on knowledge questions and unexpected events. The competitive element, by letting multiple teams play ‘against each other’, increases the involvement of the participants. Each team has several roles, which have to work together. For example, the client and the contractor. 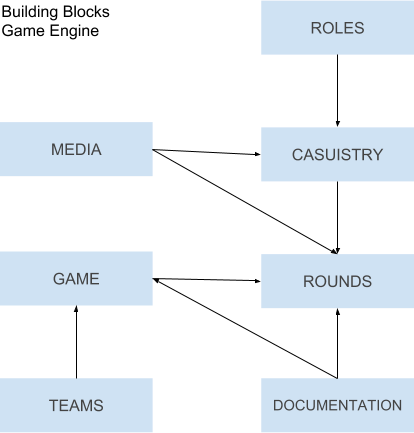 Documentation management, for participants, game supervisors and game administrators. Within the Game Engine, unlimited casuistry can be entered and managed from the context of your organisation, in the form of cases and emails. These can be used in an unlimited number of combinations in an unlimited number of games. Only the availability of case studies is the limiting factor. A game is made up of one or more rounds in which teams play against each other. Within the teams, participants from different roles must work together. In each round, the teams are placed in a certain context by means of video, image and text, they have to solve cases and handle email. By varying with the number of participants per team, the duration of the rounds or the number of cases and e-mails, the work stress for the participants can be directed. The assignments worked out online by the participants during the simulation can be viewed in real time by the game management. This enables short targeted feedback immediately after each lap. Public Private Partnerships (PPPs) are an important instrument for the development of transitional countries. Government tasks are transferred to a consortium of private parties for a longer period of time. 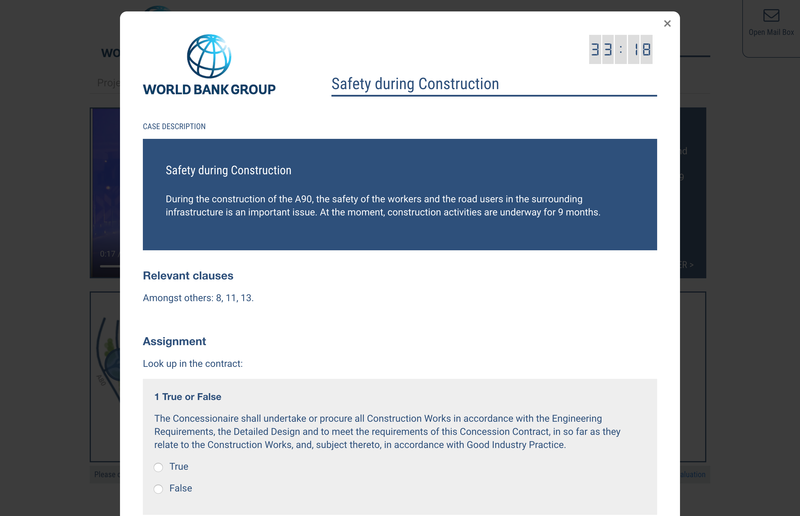 In order to allow both government and private sector employees in these countries to experience what it means to work together on the basis of a PPP, a game has been designed for the construction and operation of a toll road on behalf of the World Bank. The starting point is a 25-year concession for the fictitious A90 toll road. The division of responsibility and risk between the government as principal and the private consortium during these 25 years has been laid down in an underlying PPP contract. The start of the simulation is the transfer of the road in 1990. After that, all kinds of events on this road will pass in the period up to 2015: a ‘wild life crossing’ will be constructed, financial difficulties with the consortium, a huge accident, a flood and much more. The PPP Simulation Game is made up of 5 rounds, which simulate the construction and operation phase of the project. The start is a joint kick-off for the government and consortium project teams involved. Attention will also be paid to the operation of the PPP contract. This contract is available for every team and will also be necessary to solve the cases properly. This game is based on the DBFM Network Simulation of the Dutch Ministry of Infrastructure and Water Management, which was played more than 80 times by more than 1,000 people in total. Without exception, the closure is energetic, positive and interactive. Learning experiences are always a combination of content-related aspects (contract knowledge, operation of the DBFM) and the associated behaviour in the workplace (communication, cooperation, trust). Practice simulations are ideal for penetratingly transferring information to large groups. Participants can use practice simulations to ‘put on different spectacles’. By looking at existing situations from a different perspective, awareness processes accelerate. Practice simulations make it possible to confront employees in an organisation intensively with other roles and working conditions in a short period of time. This confrontation has a much stronger motivating effect than the classic influencing instruments. It is also an effective means of bringing people into contact with each other and of exchanging ideas. When we do not simulate the existing reality but a future desired reality, practice simulations offer participants the opportunity to take a look into the future. There is a reorganisation proposal, an information plan, a quality manual or a new AO. On the basis of this, a new reality is created with a new organisational structure, a changed job distribution, different work processes, new management systems and different customers. Participants in such a simulation quickly imagine themselves to be in a completely different organisation and can experiment with this image of the future without any risks. We generally call this application ‘organisational prototyping’. 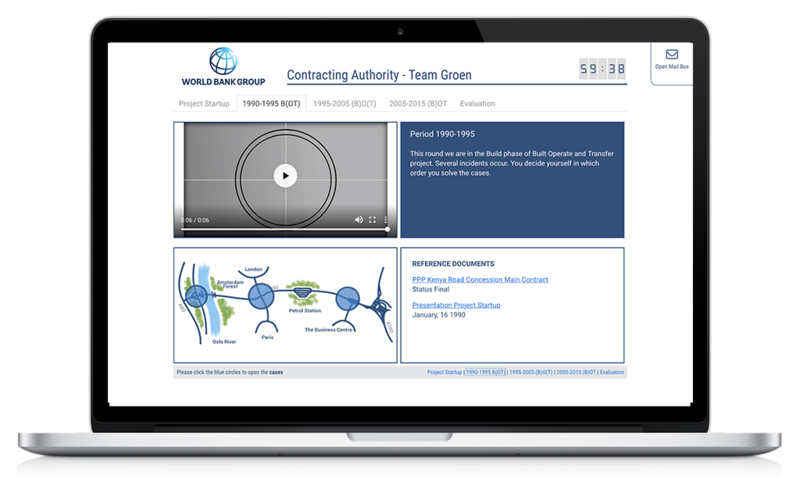 The practice simulation is an implementation tool, but also a test facility, a motivation tool and a measuring tool for the training needs of individual employees. Practice simulations are also used in the development of policy. They offer the opportunity to develop new policy alternatives and strategic options in a simulated environment by separating the participants from their existing role and the associated interests and constraints. 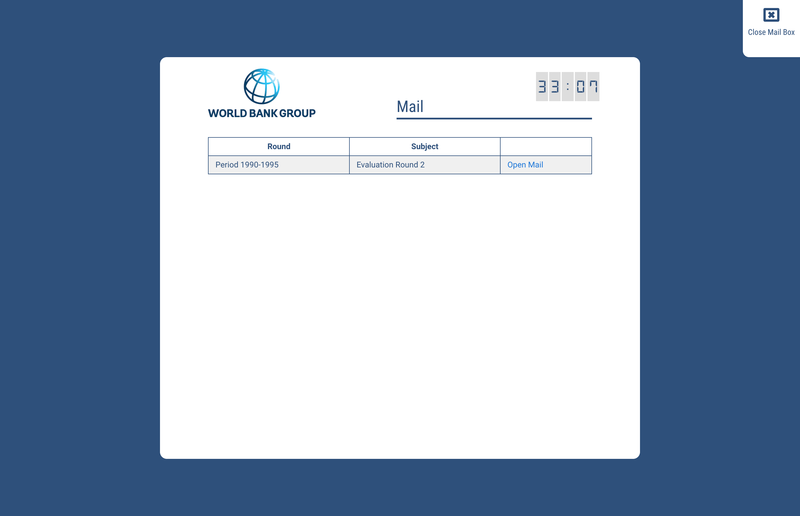 Such applications are referred to as ‘policy excerpts’ or ‘policy prototyping’. In order to gain insight into the effectiveness of the behaviour of individuals and groups, many different types of exercises were used in the past, for example role-playing with actors. Here, too, practice simulations have been introduced. On the one hand, to increase the realism of the exercises. On the other hand, to be able to assess situations in which there is no predefined desired exercise behaviour. Applications in this field are often referred to as ‘assesment simulations’. You can download the Madenco Game Engine Product Sheet HERE >. Would you like to know more about running the PPP Simulation Game or about developing your own practical simulation? Send us a message with your info, so we can contact you.